Ok, so we've had Archer Farms(Target) Ice Cream. We've had Archer Farms (Target) gelato. That just leaves Market Pantry (Target) treats to try. You know I love ice cream sandwiches, so let's get those. For a whopping $1.69, I got me *6* ice cream sandwiches. That's 28 cents a piece, or 56 cents for a Dubba sized serving. That's just crazy cheap. They had the mint chip variety and the cookies 'n cream variety which bills itself as vanilla-flavored ice cream with chocolate cookie crunches between chocolate-flavored wafers. I went CnC ofcourse. I unwrapped my treat and though you can see it in the picture above, I think this second picture better represents just how dirty this cookies 'n cream filling is. That's right, dirty. I can't think of a better term for it. I pulled the white wrapper from the box only to see a brownish CnC ice cream showing through the wrapper. I was definitely concerned, but hey, it was a buck sixty-nine. I always say ice cream sandwiches are pretty hard to mess up, and these are no exceptions. It's got decent, somewhat stiff (crunchy) wafers with a non-descript filling inside. I wouldn't say the filling is flavorless, but it's a muddled cookie vibe buried in a decently textured ice cream. I went so far as to eat most of the second sandwich sans wafers just to get a really good check on the filling. It's decent. I'm not wowwed by any means, but it's strangely satisfying and and gives us a nice mild boost to the overall wafer flavor. It works here, and that's what matters. Don't be afraid to pick up a box of these. On Second Scoop: I know I tend to be hard on things.... but I really like these. I just had two more and I could eat the two that are left. It's a nice, solid wafer that embodies what an ice cream sandwich should. I know some of you might prefer a softer shell, but for me, this crunchier shell is the way to go. The filling just ties it all together and I'm happy, plain and simple. These look very good! 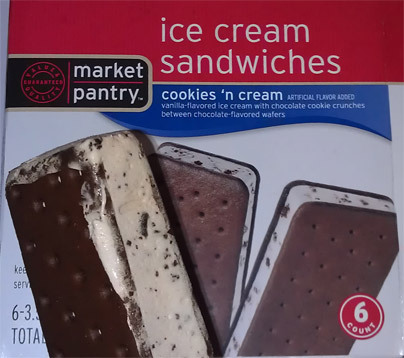 I've had the Market Pantry no sugar added ice creme sandwiches and they were awful.